Becoming a winter queen will make Ilyenna as cold and cruel and deadly as winter itself, but it might be the only way to save her people from a war they have no hope of winning. I loved Amber’s previous two books ‘Witch Song’ and ‘Witch Born’, so I was fairly sure I’d love ‘Winter Queen’ as well. I was right. ‘Winter Queen’ is a well-balanced, action packed, fluently written Young-Adult fantasy novel that will please readers of all ages. I was a bit scared I wouldn’t like the fairy aspect of the story, because my previous encounters with fairy books weren’t always good ones. It seems to me, getting it just right where fairies are involved is a tough one, but Amber nailed it. The fairies were an important part of the story, but didn’t take center stage the whole time. Why did I like ‘Winter Queen’ that much, you ask? I loved it for lots of reasons. One of them being that I really like a world based on clans and the feeling that comes with that. I love how protective clan people are of each other, how everything is back to basic and there is some sort of coherence between the people of a certain clan. Of every Fantasy book I’ve read so far, those with that clan feeling in it (Seven Realms!) always end up as one of my favorites. Another reason: the main character. Ilyenna is so easy to love, her storyline so easy to read. I was never once annoyed by anything she did or the choices she made. Everything felt just right with Ilyenna. She’s a person people love to read about, a character people will care about. And that’s the most important thing about a main character in my opinion, good or bad, if you can’t help but to care, the author has succeeded. One thing I also loved about ‘Witch Song’ and ‘Witch Born’ is that the author isn’t afraid of letting her characters suffer. Ilyenna went through so much during this book, my heart ached for her. This is a huge contribution to the story, it feels so much more realistic this way then when the character always escapes harm (or gets a minor cut or whatever). Ilyenna’s story is that of a girl with an iron will who will go through hell to protect the people she loves. On to reason number 4: Amber’s writing style. All of her books read so fluently. It’s so easy to emerge yourself in the story and read the whole book in one sitting. I can’t pinpoint what it is that makes this such a joy to read, but believe me, the writing is good! Reason number 5! The romance. So. Good. It felt so real and genuine, so sweet and with the heart wrenching mistakes we all make when in love. Sigh. It was just perfect. I can’t understand why books like Julie Kagawa’s (no offence) get such a fan base and have created such a hype and Amber’s books are more in the shadows. I couldn’t even finish the second ‘Blood of Eden’ book, because I just wasn’t interested in the proceedings of the story. I could never say the same about this book. I guess it’s all about taste and yet again this is proof that there are a lot of different people who like different things on this planet. 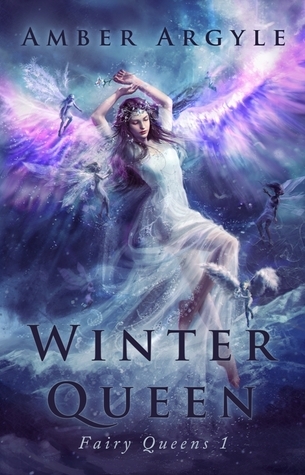 I loved ‘Winter Queen’ and if you like a really good YA book, filled with action and all kinds of different emotioins, you should give this book a try. You won’t be disappointed.